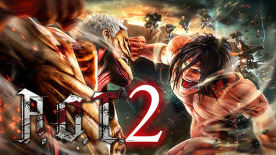 We've included moves that allow you to instantly close in on far-off Titans and slice them with "Sneak Attacks," quickly circle behind Titans and deal large amounts of damage with "Hook Drive" attacks, and more. Achieve evolved omni-directional mobility gear action that is rich with variety. The Titans' movements and reactions are more menacing than ever as they encroach on the player, but the situation is at its most severe when you enter threatening "danger zones." Using the story from Season 2 of the anime as a basis, we've prepared an original sub-story for the game under the supervision of author Hajime Isayama. In Daily Life sections, characters will appear in their plain clothes and show you sides of themselves you normally can't see. By interacting with such characters and strengthening your bonds with them, they will support your original character through "Buddy Actions," and you'll be able to experience each character's side stories.